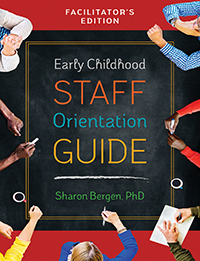 Sharon Bergen is an instructor of Early Childhood and Youth Development at Dakota County Technical College. She has over thirty years of experience in the profession as a teacher, program director, multi-site manager, trainer, curriculum writer, senior corporate executive, and NAEYC state affiliate executive director. Sharon is the author of two books published by Redleaf Press, Best Practices for Training Early Childhood Professionals and, with co-author Rachel Robertson, Healthy Children Healthy Lives: The Wellness Guide for Early Childhood Programs. Sharon holds a doctorate in education and a master’s degree in early childhood education. Valuable tools and tips for the professional welcoming new employees to their organization. 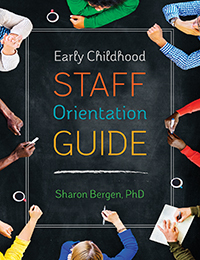 The companion to the Early Childhood Staff Orientation Guide this version provides support for the professional mentoring new employees. 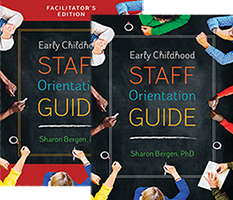 This comprehensive resource includes the vital topics for orientation to an early childhood program, tips to maximize mentoring skills, and frequently asked questions about the orientation process. A good orientation program leads to better staff retention so use this book to ensure you make the most of each new employee’s potential. Age focus: 0–5. Softbound, 152 pgs. Orientation to a new position, classroom, or an entirely new program is an opportunity to start off on the right foot. Working with children is fun, but also complex and requires knowledge of health and safety practices, child development, guidance strategies, and much more. This guide will serve as a long-term resource for employees as they grow in the profession. Reflecting research and best practices, this workbook is full of tools to help employees learn the ins and outs of their new role and the practices and policies unique to the program. Includes a certificate of completion. Age focus: 0–5. Softbound, 120 pgs.